CavanKerry Press. 2012. 72 pages. 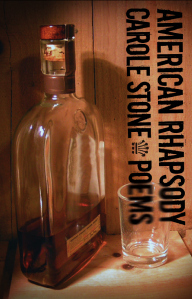 American Rhapsody by Carole Stone is a boozy, jazz-age collection of elegies for the poet’s deceased parents, as well as for America in the days of yore. Told in rhythmic, sometimes drunken party language, and woven around the physical place of New Jersey, the poems catch the reader in a whirlwind of sound, beauty, grief and nostalgia. Despite the ache of longing fundamentally present, American Rhapsody is a fun collection, one that transports the reader back to a time in this country that sounds as foreign to us as it does familiar. Oak barrels, hops and yeasty brew. flowing from kegs, basement jugs. These lines are the opening lines in the collection, and they tutor the reader about how to read what follows. We have Prohibition Era booze, kegs and jugs, and the music of “sozzled” and “booze” and “yeasty brew.” It is as though we are the merrymakers at the door and Stone has opened the door to us, the reader, inviting us inside her world of bygone days. Later in this poem her place gets particular: “on our side of the Hudson // . . . beneath the Pulaski Skyway,” “to just beyond / the twelve-mile limit off Sandy Hook” (“Invocation/Intoxication”). There is no mistaking the historical moment and physical place in which these poems are taking place, and in her opening poem, Stone graciously guides us in and through the rest of her world. stool rung, did you miss me? that call forth a mother’s love. My lips form their names. For Sue Barton, for Nancy Drew! Our whole bright lives ahead. But time works on erasing those we love and their way of life along with them. Toward the end of the collection, the speaker of the poem has come down from her drunken high and has soberly realized that “the past wears away / gradually // until nothing is left / but yourself” (“The Past”). Not only have the party-loving, free-spirited parents left, so too has the America that the poet relied on: “My dream of America, / where no one would be poor,/slipping away into history” (“History”). This collection hinges on nostalgia; nostalgia of what can never be again, what is lost forever to the pages of history. Told in jazzy, fleshly language, the poems in this collection beg the question: Is Stone’s America lost and gone forever—or did it never exist? KAY COSGROVE is a Ph.D. candidate in the Literature and Creative Writing program at the University of Houston, where she has written poetry reviews for Gulf Coast. Her own poetry has appeared in Sugarhouse Review, Zone 3, Barstorm, Floodwall, and many other journals.